Obława was somehow overshadowed by the international recognition of features such as In Darkness and Rose, both of which were released in 2011, but Krzyształowicz’s effort is anything but a third wheel to Smarzowski and Holland’s hits. Obława is certainly the most audacious of the three films in terms of narrative and editing style. 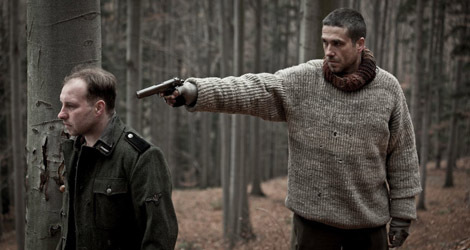 Krzyształowicz opted for a non-linear structure to recount the story of his protagonist, a Polish partisan nicknamed Wydra, ‘The Otter,’ (Marcin Dorociński) who mercilessly hunts down Nazi collaborators and performs, often gory, executions with cold professionalism. Maciej Stuhr plays Henryk, a former friend turned traitor who The Otter must kill, forcing him to examine his actions and motivations. Stuhr exudes the cowardice and insecurity of a turncoat, while Dorociński is simply impeccable in his role. Set among forest clearings magisterially captured by Arkadiusz Tomiak, Obława feels something like an extended cut-scene from a yet-to-be- released stealth game.